With thousands of Japanese restaurants currently operating in Singapore, enjoying Japanese cuisine has become an unofficial national pastime. While people are busy debating which restaurants are better, beat the crowd to experience Jun Omakase, a quaint Japanese hideout along Church Street that serves stellar Japanese creations worth every dollar. Situated in the Central Business District (CBD), Jun Omakase sees a steady stream of returning Japanese customers as well as international patrons. With its simple furnishings that exude minimalist chic, entering Jun Omakase is like stepping into comfort itself. The menu reflects the same minimalist principles that the Japanese are known for. Besides the usual appetisers and sushi rolls, they offer three types of omakase: “Natsu 夏”, “Ume 梅”, and the premium “Jun 纯”. We recommend getting a seat at the sushi counter where the executive chef brings you through the experience, from infusing your dipping sauce with shiso flowers to the best sequence in which to enjoy your sashimi. The appetisers here start easy and light. We thoroughly enjoyed the Aburi Tuna with ginger flower that cleanses the palate. Don’t be alarmed by the plate of raw white corn served alongside it, either. These delicate morsels come bursting with chilled sweetness at every bite. Trust us – you won’t be forgetting them anytime soon! Jun Omakase prides themselves as one of the few sushiya that sources fresh fish directly from Tsukiji Market. Thick slices of gleaming otoro (fatty tuna) and fresh tai (sea bream) sashimi are some of Jun Omakase’s highlights. Here, they serve them with a side of freshly ground wasabi and fragrant Japanese herbs to complement the cuts of fish. A testament of true skill lies within a bowl of chawanmushi, and Jun Omakase takes it to a whole new level. Their Snow Crab Chawanmushi is smooth and delicate, balancing a savoury broth with the sweet shredded snow crab meat. Each mouthful is rounded off with a hint of yuzu, which refreshes the palate and leaves you feeling invigorated for the next dish. Don’t let the simplicity of the Grilled Prawns with Homemade Mayonnaise fool you! This little number packs a punch with the sweet prawn meat blending harmoniously with the tangy homemade mayonnaise. Consequently, the grill lends a depth of robust flavours to the prawn. The dish that surprised us all, however, is the Grilled Eggplant with Miso Paste. Who would’ve thought that a simple vegetable such as the humble eggplant would leave us speechless with its subtle, elegant sweetness? The fermented miso adds another level of flavour, while the seared scallops and prawns give each mouthful a pleasant bite. Round things off on a lavish note with Jun Omakase’s Grilled Wagyu and Foie Gras. The beef has that melt-in-your-mouth quality that never fails to delight. Additionally, the foie gras is plump and buttery, taking on a hint of soft char. 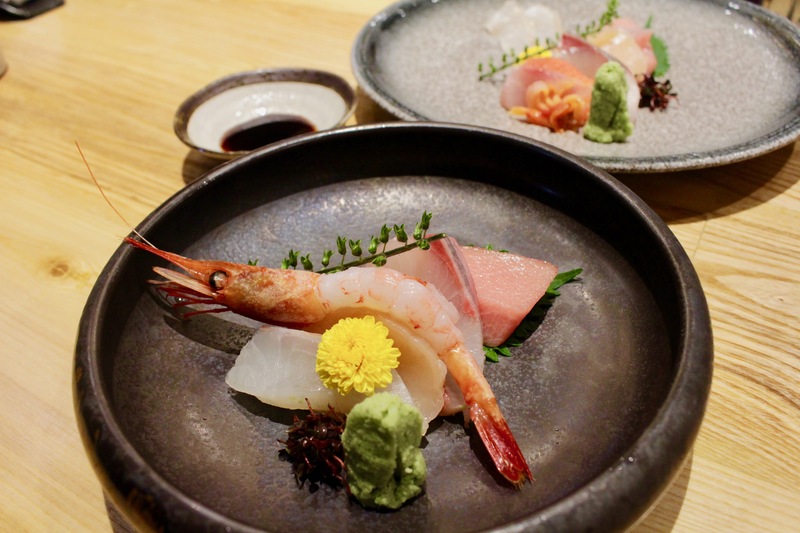 If you find yourself around the Central Business District or if you’re just looking to avoid huge crowds on the weekends, head down to Jun Omakase for a meal worth indulging in.